I am trying to identify a weed that is spreading in my lawn. It is whitish and looks a bit like a flower with 3 'petals'. It is soft like a mushroom. I think it may be a form of Mullein. The most common variety is common mullein or great mullein and this is not that. 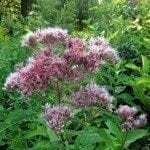 There are about 250 varieties of this plant and yours has the characteristics of the family. It was likely a decorative variety of mullein that escaped from a garden.